Well I just returned back from Toronto and boy am I glad to be home. Every time I travel to another Canadian or US City to promote our great province, I gain an appreciation for where we live. There is no doubt we live in the greatest place on earth. 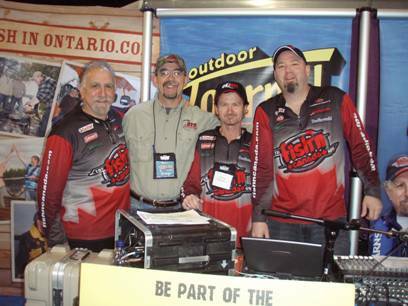 While attending the Toronto Spring Fishing Show I got to hang out with my great buddies Angelo, Pete and Mike Miller from the Fish’n Canada Show. These guys have to be the hardest working anglers I have ever met. They had two booths, one promoting the new US Reels and the other promoting Ontario Tourism. The line up to get an autograph stretched through the Isle ways, never seen anything like it. I even signed a few myself, I think someone confused me with someone who was famous, lol. 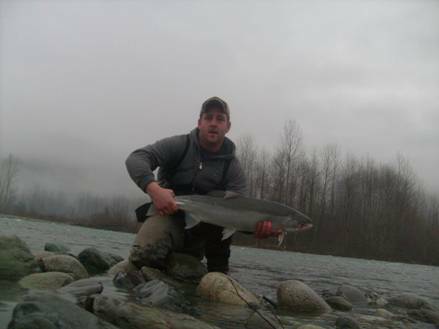 Speaking of the Fish’n Canada Show, STS has two shows airing this year on Global and WFN, Watch for Sturgeon show with Mike Miller and Bull Trout on the Upper Pitt River with Angelo Viola himself. Global TV airs Saturday mornings, check your local listings for times. Well the winter fishing is still going steady for the feeder chinook in the harbour. The usual spots along the West Van shoreline and among the freighters are producing fish most days. Coyote spoons and glow variations of hootchies are all producing at depths ranging from 60 feet to the bottom. No real need for bait this time of year as these fish are not very selective. Lots of shakers are being hooked along with the odd keeper. The size of fish this year seems to be larger than years before. The fish are fat and healthy and make for a great fight and great table fair. The flood tides and the high slack tend to be the best bet for hooking fish. Find the bait and you will usually find the feeder chinook. We have been out regularaly hooking several fish each charter, some days better than others but the crabbing remains very productive. Call us if you would like a great day on the water chasing these feeder chinooks and some great crabbing. 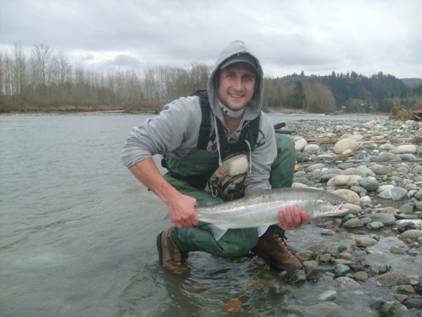 The Steelhead fishing has been excellent this past week, STS Guide Thomas Rutschmann is now at 162 fish landed which is nothing short of amazing. Water conditions are low and clear but lots of fish around if you know where they are holding. As this cold snap continues, down sizing you offering is very important. Lighter leaders and smaller baits and lures will help put more fish on the beach. 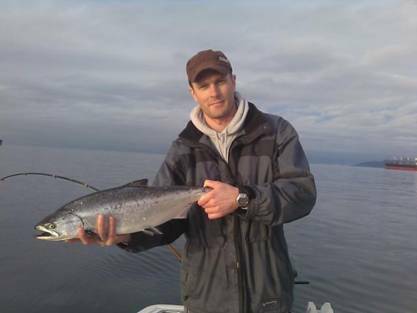 The above Picture is one of our good clients John who after a day on the water with Thomas, landed his first steelhead in several years. Hiring a guide for the day is not such a bad idea when your just not producing fish. Guides like Thomas are like hiring a tech geek to help you learn Facebook or fix your PC. They do it every day, live and breath their passion and are darn good at it. If you like to spend a day on the water with Thomas, give us a call and we can set you up. 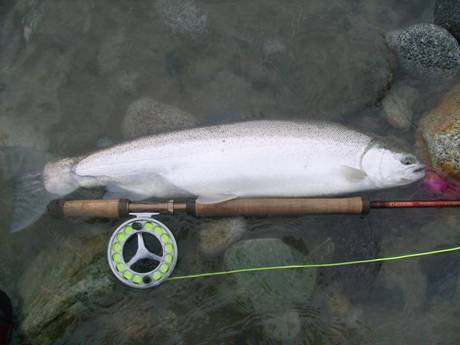 Fly fishing for steelhead is one of lifes great challenges, ask any angler who has tried, it is not easy. I know this is going to sound sick, but Thomas was trying to challenge himself so he pulled out the fly rod a few days ago, poor Thomas hooked 2 steelhead on the fly in the first 20 minutes and went home disappointed, he was hoping that he would have to work hard for a fish that day. What can we say, this kid is one of the best, that’s why he is in his 11 year of guiding. Bill Otway for those of you who do not know, is one of British Columbia’s champions. A life dedicated to protecting fish and fishermans rights to sport fish, Bill worked tirelessly for all British Columbians and those anglers who visit this great province each and every year. Bill passed away recently which has left the sport fishing community with a huge loss, I doubt anyone could fill those shoes. This past week I was attending the Toronto Spring Boat & Sportsman Show, on Friday morning there was an industry breakfast that to my surprise included ceremonies for the 2011 inductees into the Canadian Angler Hall Of Fame. 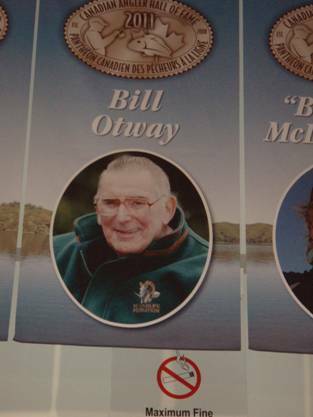 It was my privilege and honor to be in attendance while our very own Bill Otway was inducted into the Angler Hall Of Fame. Bills Son and Daughter in-law were both in attendance to accept the award. I met with his son and he said that Mr Bill Otway while very ill was still working on projects and giving instructions right up until the end. That’s Bill all the way, never quit, never give up, a true Canadian Legend. Don’t forget the BC Boat & Sportsman Show is coming March 4,5,6 in the Abbotsford Tradex Center, please drop by and see us at our booth. I will also be answering questions at the New Pure Fishing “ Ask the Experts Panel” on the main stage each and every day, Check the show guide for times. I might have a few freebees on hand as well so be sure to catch our show.